The Followell Family: Mother's Day 2009! This Mother's Day was great. Nolan bought me a patio set I had been wanting for a long time. I love the memories I have of growing up and eating on our balcony in the summer. We try to eat outside every night. Caden made me a card that was in the shape of a watering can and gave me seeds to plant as well. 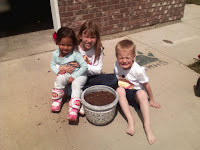 I bought a cute pot and the kids helped me plant them on Mother's Day. They are growing really well, but are only green leaves so far. That weekend, Nolan, was on graves so I had to make my own meal but it was FABULOUS! Good thing his sister, Spring, was there. She helped make my load a lot lighter. We had chicken and steak shish kabobs, with dill red potatoes, green beans and my mom's famous cheese bread. My mouth is watering just thinking about it. Anyway, it was a great day. I can't believe how lucky I am to be able to be a mom. I don't take that responsibility for granted. I have two great kids and I feel so blessed that I was chosen to be their mother.